EIL Notification is out. 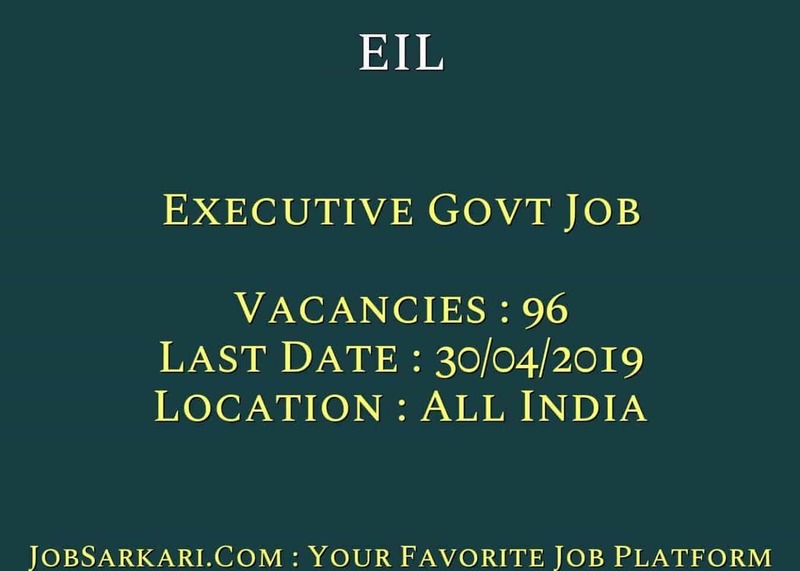 EIL is recruiting for 96 Executive Govt Job Posts. You can check EIL - Engineers India Limited last date, download EIL notification, visit EIL official website and check other EIL Vacancy details.Complete Vacancy and recruitment Details about 96 Executive Govt Job vacancies in EIL are provided below by JobSarkari.Com only for you. Last Date of Apply Online. 30/04/2019 Up to 11:59 P.M.
Executive Gr.-IV. 25. 14. 05. 09. 04. 57. Executive Gr.V. 15. 08. 03. 05. 02. 33. Executive Gr. VI. 05. 01. 00. 00. 00. 06. Total Vacancy. 45. 23. 08. 14. 06. 96. Executive Gr. IV Civil. Candidate Must Have Passed BE/ B.Tech/ B.Sc Engineering in Civil Discipline With 60% Marks And Having 16 Years Post Qualification Experience in Related Field. Max 48 Years. Executive Gr. V Civil. Candidate Must Have Passed BE/ B.Tech/ B.Sc Engineering in Civil Discipline With 60% Marks And Having 19 Years Post Qualification Experience in Related Field. Max 50 Years. Executive Gr. VI Civil. Candidate Must Have Passed BE/ B.Tech/ B.Sc Engineering in Civil Discipline With 60% Marks And Having 21 Years Post Qualification Experience in Related Field. Max 52 Years. Executive Gr. IV Mechanical. Candidate Must Have Passed BE/ B.Tech/ B.Sc Engineering in Mechanical Discipline With 60% Marks And Having 16 Years Post Qualification Experience in Related Field. Max 48 Years. Executive Gr. V Mechanical. Candidate Must Have Passed BE/ B.Tech/ B.Sc Engineering in Mechanical Discipline With 60% Marks And Having 19 Years Post Qualification Experience in Related Field. Max 50 Years. Executive Gr. VI Mechanical. Candidate Must Have Passed BE/ B.Tech/ B.Sc Engineering in Mechanical Discipline With 60% Marks And Having 21 Years Post Qualification Experience in Related Field. Max 52 Years. Executive Gr. IV Electrical. Candidate Must Have Passed BE/ B.Tech/ B.Sc Engineering in Electrical Discipline With 60% Marks And Having 16 Years Post Qualification Experience in Related Field. Max 48 Years. Executive Gr. V Electrical. Candidate Must Have Passed BE/ B.Tech/ B.Sc Engineering in Electrical Discipline With 60% Marks And Having 19 Years Post Qualification Experience in Related Field. Max 50 Years. Executive Gr. VI Electrical. Candidate Must Have Passed BE/ B.Tech/ B.Sc Engineering in Electrical Discipline With 60% Marks And Having 21 Years Post Qualification Experience in Related Field. Max 52 Years. Executive Gr. IV Welding/ NDT. Candidate Must Have Passed BE/ B.Tech/ B.Sc Engineering in Mechanical/ Metallurgy Discipline With 60% Marks And Having 16 Years Post Qualification Experience in Related Field. Max 48 Years. Executive Gr. V Welding/ NDT. Candidate Must Have Passed BE/ B.Tech/ B.Sc Engineering in Mechanical/ Metallurgy Discipline With 60% Marks And Having 19 Years Post Qualification Experience in Related Field. Max 50 Years. Executive Gr. VI Welding/ NDT. Candidate Must Have Passed BE/ B.Tech/ B.Sc Engineering in Mechanical/ Metallurgy Discipline With 60% Marks And Having 21 Years Post Qualification Experience in Related Field. Max 52 Years. Executive Gr. IV Instrumentation. Candidate Must Have Passed BE/ B.Tech/ B.Sc Engineering Instrumentation Discipline With 60% Marks And Having 16 Years Post Qualification Experience in Related Field. Max 48 Years. Executive Gr. V Instrumentation. Candidate Must Have Passed BE/ B.Tech/ B.Sc Engineering Instrumentation Discipline With 60% Marks And Having 19 Years Post Qualification Experience in Related Field. Max 50 Years. Executive Gr. VI Instrumentation. Candidate Must Have Passed BE/ B.Tech/ B.Sc Engineering Instrumentation Discipline With 60% Marks And Having 21 Years Post Qualification Experience in Related Field. Max 52 Years. Executive Gr. IV Warehouse. Candidate Must Have Passed BE/ B.Tech/ B.Sc Engineering With 60% Marks And Having 16 Years Post Qualification Experience in Related Field. Max 48 Years. Executive Gr. V Warehouse. Candidate Must Have Passed BE/ B.Tech/ B.Sc Engineering With 60% Marks And Having 19 Years Post Qualification Experience in Related Field. Max 50 Years. Executive Gr. IV Safety. Candidate Must Have Passed BE/ B.Tech/ B.Sc Engineering With 60% Marks And Having Diploma in Industrial Safety With 1 Paper in Construction And Having 16 Years Post Qualification Experience in Related Field. Max 48 Years. 3. Candidates are Required to Fill All Basic Details Carefully Such as Name, Mobile No. And E Mail ID. 4. Candidate Have to Upload Photo And Signature As Prescribed Size And Format And Need to Save Data. 5. After that Candidates Are Required to fill Some Details Such As Qualification, Experience, Address etc. 6. After Save the Data System Will Generate the Registration Number And Password As Displayed on Screen as Well as Through SMS and E-Mail. 7. After Successful Registration Candidate can Log In with Registration No. and Password. 8. Please Remember and Save your Registration No. And Password for Further References. 9. Online Applications Can be Submitted on or Before 30th April 2019. Q. What is the Last Date For EIL Executive Govt Job Vacancy ? A. 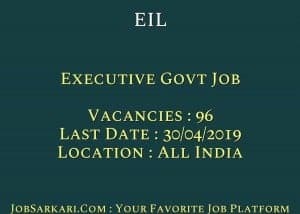 Last Date for EIL Executive Govt Job Posts is 30/04/2019. Q. What is the Form Type of EIL Executive Govt Job Recruitment ? A. The Form Type for EIL Executive Govt Job Posts is Online. Q. How many vacancies are available in Engineers India Limited Executive Govt Job Posts ? A. There are about 100 Vacancies in Engineers India Limited Executive Govt Job Posts. Q. What is the Full Form of EIL ? A. Full Form of EIL is Engineers India Limited .